It's late August...the farmers are busy harvesting the last of the corn, tobacco and peaches....but those tomatoes are still going strong. I bought a 25-lb. box of plum tomatoes at a local farm on Friday for $3.00. That is not a typo. So far I've made a huge batch of sauce, served tomatoes two mornings in a row to guests, ate at least 3 sprinkled with salt and oozing juice over the sink, made a nice tomato jam and still I have half a box. I'm beginning to think that they multiply when I leave the room. They look innocent enough sitting there, but clearly they can't be trusted. I just may have to give them as parting gifts to guests! At any rate, here's my favorite recipe for sauce. I've been making this recipe since I worked at Forest City - Pat, if you are out there anywhere, I still use your recipe! Sauce: Put all of this in a big pot: at least 15 tomatoes - preferably plum - cleaned and seeds and juice removed, 2 cloves garlic, 2 teaspoons each of marjoram, and oregano, 1 tablespoon honey, salt and pepper to taste, a tablespoon of olive oil. Cook, stirring occasionally, for several hours. Use an immersion blender to incorporate all ingredients - including tomato skins - it will grind them up. (I used to take the time to peel but it's so much easier this way). Taste and adjust seasoning as you like. This sauce will freeze if poured into freezer bags and is a breath of summer in February....if it lasts that long! Enjoy. Bruce and I have long talked about putting up a blog. So, here it is Saturday night of Labor Day weekend. He sits at a show in Pittsburgh and I'm at the inn thinking that this is as good a time as any to start down this unknown road. 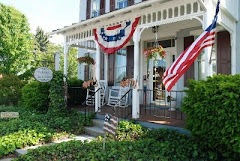 We own a three-room bed and breakfast in northeastern Lancaster County called The Artist's Inn. We also own two vacation rentals - The Olde Stone Cottage and The Carriage House - homes that are also located in our little town of Terre Hill. Through this blog, we hope to share a behind-the-scenes look at life as an innkeeper, life from an artist's perspective, and what it's like to live in one of the most beautiful places we know and love....Lancaster County, Pennsylvania.